Explorer’s Eye Press. Geneva. 2016. This is the fifth book in a five-book series of unusual (and true) personal travel tales. What’s the attraction of coffee that’s been digested by a civet? Can 200-million-year-old fossilized freshwater shark dung bring you good luck? Why do boys like to make things go bang — hey, lemme try the AK-47!? Why is the belching and slovenly widow of Laos’s first president so possessive about the animal she considers her white elephant? How did Vietnam’s last elephant hunter, at the age of 90, get a lucrative sponsorship deal for a tonic that makes men more powerful? Did a love potion help a Filipino politician become governor? And what role did an absurdly-rich, secretive American businessman (who enjoyed deflowering virgins) have in creating Vietnam’s golf boom? This is Southeast Asia as you’ve probably never imagined, full of curious people, startling happenings and unexpected moments of humanity and introspection, giddiness and solemnity, avarice and ambition. Exploring Thailand’s love of magic amulets, talismans and spiritual-gadgets. He’s notched up 298 pachyderms, and a lucrative product endorsement contract. Communist leaders use the animal to co-opt the power and prestige of Buddhist kings. Releasing the macho urges with a bang in Cambodia. Searching for the perfect dung-delicious civet coffee. Vietnamese artists search for that enigmatic smile. Vietnam’s street kids learn the restaurant business. The king, the architect, and the scoundrel who created Vietnam’s golf boom. Ready-to-use potions help politicians turn on the charm. 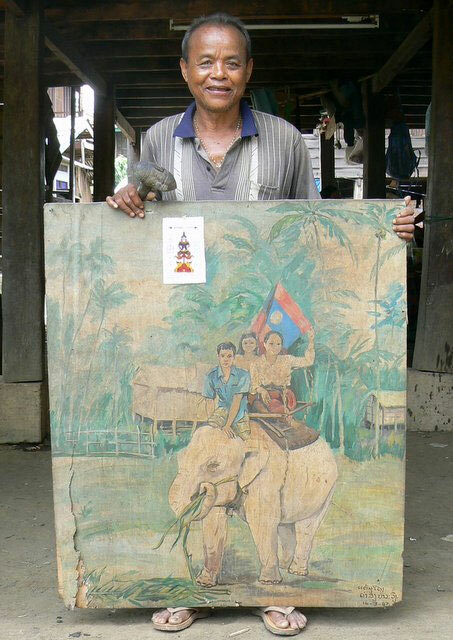 Boun Somsy, with a painting of his white elephant that was liberated by the wife of the country’s first president. Capturing a rare white elephant usually brings luck and fame, and it did for Boun Somsy, at least for a while. Then, as sometimes happens, a couple of wannabe-royals stepped in and rained on his parade. This is a tale of prophetic (and sensual) dreams, an unexpected windfall, how an areligious communist government usurped a potent religious symbol, and, as is so often the case, nature conservation. The problem was that Boun, then 39, had never caught any elephant, which is a bit like telling a couch potato to go run a marathon. Nevertheless, Boun instructed his wife to refrain from combing and oiling her hair, which would have made his hunting ropes slippery. Boum and his elephant-hunting friends slept rough in the forest in a simple shelter. On the fifth night of the hunt for the Lao equivalent of the Holy Grail, Boun had another dream. Same beautiful woman, similar message. “I will give you this mansion,” she said, gesturing towards her estate. The next morning Boun spotted and captured a juvenile female elephant. On bringing the dirty animal back to the village and giving it a good scrub, he saw that it was “the color of old bamboo,” a rare and holy white elephant. Devotees, some from distant villages, came to pay homage to his white elephant, leaving behind offerings and some much-needed cash. Sali and four white elephant examiners inspected the animal and gave Boun the good news that he would have the honor of donating the auspicious beast to the citizens of the fledgling People’s Republic of Laos. In olden days the animal would have been offered to the king, but Prince Souvanna Phouma, the nation’s top-ranking royal, had been deposed as prime minister by Kaysone Phomvihane in 1975, making commoners Kaysone and his wife Thongvinh de facto royalty in the social hierarchy. Boun was instructed to ride the people’s elephant to the capital of Vientiane, a journey that took 29 days. He was offered no compensation, nor public gratitude. The reason that Kaysone Phomvihane and his ethnic-Vietnamese wife Thongvinh wanted the white elephant is both completely understandable yet somehow paradoxical. Here’s the conundrum. The white elephant is seen as a religious miracle, a descendant of the holy white elephant which Queen Maya dreamt entered her body nine months before Prince Siddharta, who was to become Buddha, was born. The white elephant historically represents the power of the Buddhist kings of the region, and the kings of neighboring Burma, Thailand and Cambodia fought a series of wars between 1549 and 1769 dedicated, in part, to stealing each other’s white elephants. Kaysone Phomvihane (whose name derives from a Pali word describing the four sublime states of mind achieved by a Buddhist monk), the first prime minister, and later president, of communist Laos, simply wanted to be viewed as a fair, righteous and powerful king. Or, more likely, observers suggest, his wife Thongvinh Phomvihane wanted to be viewed as a fair, righteous and powerful queen. Through a well-placed Laotian friend I was given a rare interview with semi-reclusive Madame Thongvinh. Her husband was a Pathet Lao, Vietnam-supported, revolutionary hero, and today his self-satisfied and well-fed portrait appears on the country’s currency, and an eight-million dollar museum has been built in his honor. To use an American simile, meeting Madame Thongvinh was like getting an interview with Martha Washington. Looking like a frail seventy-something woman who had just woken from a nap, she was guarded and reticent. She wore a worn, not overly-clean housedress. We sat in her comfortable house on the outskirts of Vientiane. She spoke neither French nor English, and my friend translated. After pleasantries on my part, greeted with stoic silence and the reluctant offering of a glass of water on hers, I asked about her white elephant. “Why do you want to know?” she grunted, followed by a sailor-quality belch that threatened to wilt the plastic flowers in her living room, where most of the wall space was taken up by photos of her and her husband during their glory days, alongside one dramatic photo of her white elephant.